If the Washington Wizards are not able to squeak into the playoffs, they will have no one but themselves to blame with their roller coaster inconsistency. After playing a complete game in Atlanta, the Wizards reverted back to poor perimeter defense at home against the Hawks. In a game where defense was optional, Washington looked like it might be able to hang out up 8 with a bit more than two minutes to play. They blew that lead, missed a game-winning attempt in regular and repeated the same in the first overtime session. In the second they missed a potential game-tying shot and fell 132-129 at home to Minnesota. Their shots at making the playoffs become nearly non-existant now. Number one overall pick Karl Anthony-Towns showed the DC area why he is the odds on favorite to win rookie of the year this season. The Kentucky product started the game by making his first four shots when matched up with Markieff Morris. In a suprise move in the bench rotation, recently signed guard Marcus Thornton entered the game before Garrett Temple fresh off of his 23 point performance. While changes were being made in the backcourt, Jared Dudley returned to his shooting form from earlier in the year by hitting three consecutive jumpers including two from beyond the arc. At the end of twelve minutes of play Washington led 29-27. 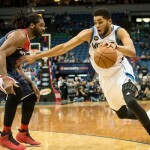 The Minnesota Timberwolves defeated the Washington Wizards, 97-77, Wednesday night at the Target Center in Minneapolis. Nikola Pekovic scored 15 points and grabbed 13 rebounds, while Kevin Martin led the Wolves with 28 points. The game was overshadowed by the return of Kevin Garnett to the team where he became a superstar over seven years, before he was traded to the Boston Celtics. This was the biggest blowout victory of the season for Minnesota, and holding the Wizards to 77 points was the Wolves’ defensive season-low in points. The Wizards were up, 20-11, at the quarter break after quickly jumping out to an 18-3 lead. The Wolves tied the game at 42 at halftime by outscoring the Wizards, 31-22, in the second quarter. The Wolves took their first lead on their first possession of the second half when Garnett fed Andrew Wiggins for a dunk. Minnesota cruised thereafter, opening up a 14-point lead at the end of the third quarter. Marcin Gortat scored nine points and pulled down 15 rebounds in a losing effort for the Wizards. The Wizards have lost their fifth straight and 10 out of their last 12. The Wizards were playing without Bradley Beal and Paul Pierce due to injury. Kris Humphries left the game in the second quarter with a hamstring injury. The Washington Wizards defeated the Minnesota Timberwolves, 109-95, Tuesday night at the Verizon Center in Washington. John Wall tied a career high with 17 assists to go along with 21 points while Rasual Butler led the Wizards with 23 points off the bench. It was the Wizards’ fifth straight victory. Washington (18-6) is now 12 games over .500 for the first time since the end of the 1978-79 season when they finished the campaign at 54-28. In case Friday night’s 120-98 loss to the Minnesota Timberwolves hadn’t been frustrating enough, the Washington Wizards also lost Bradley Beal to injury late in the fourth quarter. With just 4:25 left to play, Minnesota forward Luc Mbah collided with Beal’s left knee on a screen and Beal fell to the ground, unable to get up without assistance. Washington’s Jan Vesely and Trevor Ariza helped Beal to the locker room. The shooting guard will reportedly undergo an MRI Saturday. By the time Beal left the game, the Wizards were well on their way to a crushing loss. John Wall recorded a game-high 26 points, but his teammates hardly shared in the wealth. Beal posted 14 points and Nene added another 13, but Washington did little to slow the Wolves’ starting five. In turn, Minnesota’s Kevin Love posted 25 points and 11 rebounds and Nikola Pekovic added 18 points and 10 rebounds to help keep the Wizards at a distance. 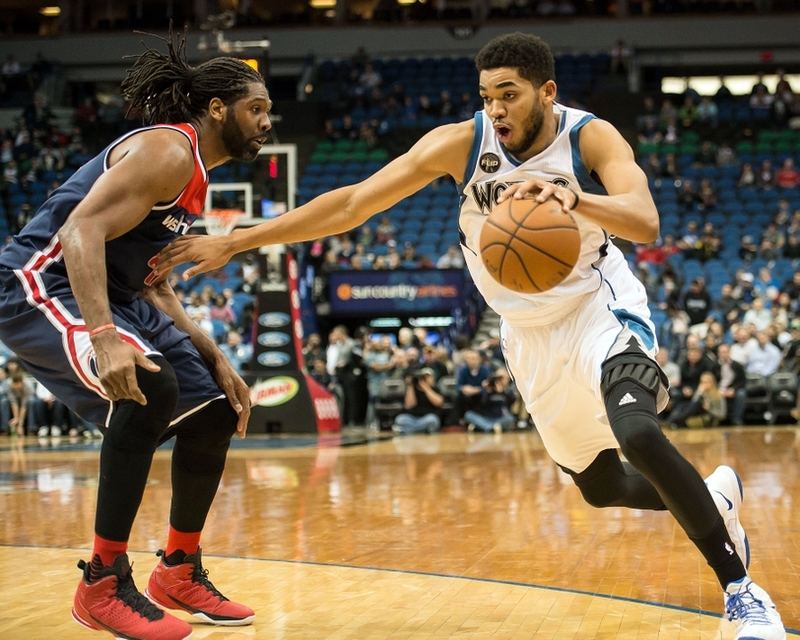 All told, the Wolves out-rebounded the Wizards 44-35. Surprisingly enough, the Wolves got off to a sluggish start in the first quarter, sinking less than a third of their shot attempts. But, they remained in control for much of the game and turned the ball over just five times on the night. They also took advantage of gifted baskets by going 31-for-38 on free throws, while Washington went 14-for-17 from the line. Friday night’s contest marked the Wizards’ first game since Dec. 21. With the loss, Washington is still one game shy of tying last year’s total road wins. The Wizards finished the 2012-2013 season with a dismal road record of 7-34. After losing four straight, the Washington Wizards entered Tuesday night’s game against the Minnesota Timberwolves, desperate to snap a streak that has landed them last place in the Southeast Division. With the help of Bradley Beal’s 25 points and John Wall’s career-high 16 assists, the Wizards bounced back late in the game. But, in order to do so, they had to quiet Minnesota’s Kevin Love, who tallied 16 points in the first quarter alone. John Wall and Trevor Ariza posted 19 and 16 points respectively, but mental errors cost the Washington Wizards (19-40) their shot at catching the Minnesota Timberwolves (21-37) Wednesday night in Minneapolis as the Wiz fell 87-82. The Wizards had to press onward without their leading scorer, Bradley Beal, who missed Wednesday’s game due to a sprained left ankle. Regardless of whether or not Washington missed Beal’s presence on the court, the team only hurt itself further by committing 24 turnovers, compared with Minnesota’s 14. WASHINGTON–The Washington Wizards came home and kept their relatively good play going as they ran away from the Minnesota Timberwolves 114-101 and earned their tenth win of the season. Wizards guard John Wall started his first game of the season and had 14 points and 5 assists in the win. John Wall was also happy with his effort. Who is this team and what have they done with the Washington Wizards? After having a fairly successful West Coast road trip, the Wizards returned home to down the Minnesota Timberwolves 114-101.